Our second day in Telluride was spent on the north side of the crest, in Yankee Boy Basin for a climb of Mt. Sneffels. I had climbed this peak two years earlier on my first visit to the San Juans, but Eric was keen on climbing it and I had offered to go along as guide and help with the short class 3 sections. Steve was more or less along for the ride, not really caring one way or another exactly what we did each day. From looking at a map, one might think the shortest way to Yankee Boy Basin from Telluride would be to drive up and over Imogene Pass. From the previous day, however, we discovered that this is a slow route, taking well over two hours to drive maybe 20mi. A faster route goes around the long way to the north through Ridgeway and Ouray, all on highway, in little over an hour, then most of a second hour to drive up into Yankee Boy Basin. We had left Telluride by 5a to give us an early start that Eric craves when doing 14ers, worried as he is about thunderstorms. There was almost no one on the road at this time of the morning though we came across half a dozen parties on foot as we crawled up the last few miles of the rough 4WD road to the high trailhead at 12,500ft, only a mile from Mt. Sneffels. It would be a short hike, but as part of the deal with Eric, I would have a chance to climb one or two other peaks in the area before the day was done. It was nearly 7a by the time we'd reached the TH and were ready to head out. Mt. Sneffels is considered one of the easier "technical" 14ers, really just a short bit of class 3 by the easiest route. I had used the SW Ridge on that first visit for the ascent, and Lavendar Col for the descent. We would use the latter going both ways today, to make things easier for Eric (I'm pretty sure Steve could have done the SW Ridge with little trouble). We spent two hours to climb 1,600ft over the course of one mile, about 3/4 of that on a decent trail. The trail deteriorates as it climbs the broad, steep chute to Lavendar Col, and it is here that we slowed considerably as did the other parties we were sharing the mountain with. It was a time for jokes, caution, catching one's breath and enjoying the high mountain air. Though there was some sunshine in the early morning, the clouds from the previous evening's thunderstorms never really dissipated and we found ourselves in overcast conditions with clouds moving in to cover the summit as we neared. Some very light precipitation fell, but nothing serious and no thunder & lightning. Just before reaching the col we turned left to climb a class 2 gully filled with rock and talus, more slow going but nothing dangerous. Just below the top of this gully heading west, a short crux is encountered in climbing out of the gully to the left, perhaps a hundred feet below the summit, passing through a V-shaped groove. Others had warned that a "crucial hold" had broken, rendering the route as class 4 instead of class 3, but the crux had very little exposure and was really just a harder class 3 move or two. Once past this, easier scrambling leads to the summit only a short distance away. Our timing seemed poor at first, as we found ourselves among the clouds with weak views. The summit register was really just an ammo box used as a trash can and we didn't bother to even look at the contents. Eric was concerned about the weather and was eager to not be on the summit in case the thunderstorms returned. It was here that I asked Eric if he needed me to help him return to the col. If not, my preferred descent would be down the SW Ridge so that I could then climb Gilpin Peak afterwards. My backup, if Eric wanted the guidance, would be to climb Kismet to the east of Mt. Sneffels. Eric preferred the reassurance of my company so we settled on returning together back down to the col. The clouds that had seemed to engulf the summit began to part, giving us some nice views off the four points of the compass. Steve and I chatted briefly with another climber that had just come up the SW Ridge before starting down ourselves to catch up with Eric who had already started back. We reversed the moves at the crux with little trouble before starting down the gully. Other parties were both ascending and descending the gully at the same time. One particular gentleman was proudly sporting bright pink pajama pants, which somehow fit seamlessly with the comic nature of climbing a CO 14er. When we got down to the col, I bade my companions goodbye and headed off for Kismet about a quarter mile on the other side of the col. Despite the short distance, it would take me a good 45min to find my way along the complex ridgeline. Going from a well-traveled 14er route to a loose, tricky ridgeline was a welcome contrast. For added distraction it started hailing while I was enroute, enough to begin collecting on the ground but not enough to be a real hazard. I found I was unable to follow along the ridgeline directly and had to drop down a few hundred feet on the south side of the ridge in order to find a way up to Kismet that would stay at class 3. 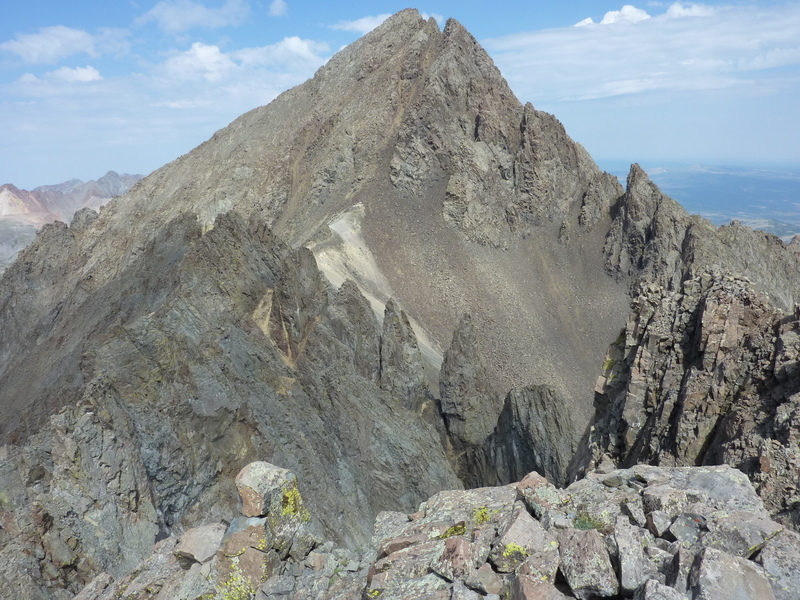 The skies had partially cleared again by the time I reached the summit around 10:45a, giving me a fine profile view of Sneffels to the west, with Cirque, Teakettle and Potosi to the east. These last three would give me good reason to come back for future adventures here.